Originally built for Captain Couse this Packet had a notable career in the Packet Service. Captured by a French brig in 1795 she was re-captured by the British frigate HMS Porcupine. In 1808 she was unable to land the Lisbon mail because of a French blockade of Portuguese ports. The Post Office Agent had to board her well off-shore. The following year she carried the first mail to Rio de Janeiro. And then, in 1814, she was involved in a gun battle with an American Privateer schooner, shooting away her main halyards and very nearly taking her as a prize. The Americans were just able to get their sail re-set in time. Captain Bullock received his commission on 22nd August 1812, ‘in room of Capt. 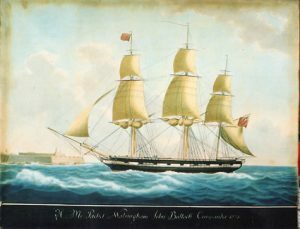 Roberts resigned’, having previously commanded the temporary Packet Express (Commission dated 12th March 1808) and having been wounded in action on board her. The summary of the Packet fleet prepared for the Admiralty when they took over control of the Service in 1823 records that she underwent general repairs in 1820 and that she had been ‘purchased on resignation of Capt. Roberts’. She was sold out of the Packet Service in 1825 and Captain transferred to command the Redpole, a Royal Navy Cherokee class brig. It was Captain Bullock who developed the garden at Penmere in Falmouth. Whilst in command of the Redpole in 1828 he and all the crew and passengers were killed by pirates of Buenos Ayres. The Packet signal flag shown in the painting presents a problem. In published references of the period the red flag is listed as belonging to the Salisbury. One from 1810 shows the Walsingham as having a red swallow-tail flag assigned to her whilst those published in 1816 and again in 1819 show a plain blue flag. By c1824 the blue flag was assigned to the Redpole, an Admiralty brig, ‘Cmd. Bullock[e]. The Redpole was lost at sea in 1828. Whilst there does not appear to be any immediate connection between the Salisbury and the Walsingham, there can be no doubt that this painting is meant to represent the latter vessel. However, more research is likely to reveal relationships of owner, contracts or commander between the two vessels. Certain features of this portrait are painted in a different style from other paintings. For instance, the sea is treated much more freely and an attempt is made to depict an appropriate sea-state for the fresh westerly wind. Another noticeable feature is the shading of the topgallants; only in this portrait and that of the Francis Freeling does it match, as it should, that on the topsails. Also, with the wind further aft than in other portraits the flags can be shown flying realistically without losing their visibility. On the other hand there is evidence of haste in the drawing where, for example, the rigging overlaps the edge of the fore-topsail. Nevertheless, the basic ship portrait formula is followed. The result is a lively picture that conveys a lively impression of the Packet’s arrival.